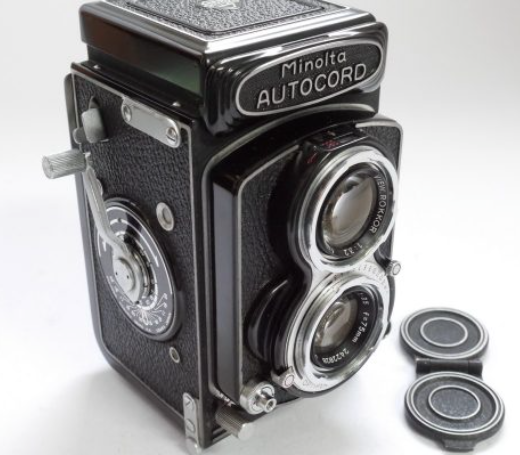 The Autocord on offer at MW Classic Cameras. Is camera equipment buying infectious, like yawning? I'd been doing rather well lately to keep myself from looking too closely at the various camera dealers whose websites I find overly attractive. Gear acquisition syndrome has no cure, as far as I'm aware, beyond simple cold turkey. Or, possibly, bankruptcy. I'd even had another bout of "gear rationalisation" and was thinking of ways of reducing the stuff I have both to simplify life and maximise the amount of free space in what will be my new darkroom. Then up popped Phil Rogers with his new purchase of a 150mm Sonnar for his Hasselblad. This coincided with the fact that I, along with Cath and Freya, was laid low with a horrible viral infection, making me particularly vulnerable to some retail therapy. On top of that, my old repetitive strain injury was back which sort of fed into the retail therapy loop. It's something that afflicts me whenever I spend too much time on a computer. It first flared up when I was a reporter. The action of using a mouse with my right hand for hours every working day gave me a real ache in my hand and wrist. Rather than complain on health and safety grounds or pop along to the dehumanised resources office, I simply trained myself to use the mouse with my left hand. Et voila! No more RSI in my right hand. A year later, however, I had RSI in my left hand so maybe not so clever after all! That's why I haven't posted anything lately: the only cure is time away from a keyboard. Anyway, back to Phil as it was all his fault. His purchase started me wondering if any of the likely retail suspects might have a waist level finder for my Rollei SL66E. I've got the 45 degree prism for the camera but it's big and heavy and means the camera has to be held up to the face when it's not on a tripod. A WLF would make hand-holding much easier. I bought the SL66E outfit from MW Classic Cameras so I went to have a look on their website. No luck on the WLF front - but what a trio of supremely attractive Minolta Autocords they had! One was in collectible condition and the other two weren't far behind. These TLRs date back to the 1950s and have cracking lenses. Their only weak spot is the focusing lever which protrudes from the bottom of the lower taking lens. The metal chosen for the lever seems vulnerable to metal fatigue - camera RSI, if you like - and can snap off in use. Presumably the grease on the focusing mechanism hardens over time and the lever becomes increasing difficult to operate. Other than that, though, they are fine picture-taking machines. This would have been bad enough but making the need for G.A.S. almost intolerable was the fact that I've always wanted a camera from 1961 - the year I was born - and one of the three Autocords was made that year! Well, I did some web-based research, imagined myself using the Autocord and thought what a good value machine it was at £149. Worse was to come when Cath, who is supposed to be more like potassium bromide than hydroquinone, said I should get it if I really wanted it. Can you see all these malevolent forces aligning against my better anti-G.A.S. judgements? I was sorely tempted, I can tell you. A nice Autocord would have given me a wee boost and, feeling the way I was with the virus and RSI, I felt I needed something to keep me going. But then I thought, "what would I do with it?" I'll tell you exactly what I would have done with it: shot a couple of rolls, marvelled at the results and then stuck it in a cupboard where it would have sat in the darkness apart from one or two outings per year. I've done that with more than a few cameras. Perhaps we're all a bit guilty of it? It made me think of my Rolleiflex Automat MVS, a very capable TLR from 1954. I looked the Rollei out for reappraisal and realised that the Autocord could never hold the same place in my affections that the Rollei does although it's the latter's equal - at least - in most respects. It must have been about 35 years ago when I bought the Rollei from an industrial photographer who worked with Timex. It was my first medium format camera. I haven't used the Rollei much lately either since its slow speeds are sticking but I've been thinking about making it my main night camera as B works OK and it's lighter - and less valuable - than the 2.8F. So with considerable self-restraint, I decided not to buy the Autocord. £150 is too much to splash out on what would have become little more than an ornament. Is this a sign of maturity kicking in at last? Or just an indication that I'm now well into "middle age" and becoming increasingly afflicted by a "been there, done that" attitude? I no longer get the same buzz or inspiration from a new piece of camera gear. In some ways, that's not a good thing. I'm reminded of an old guy who was a member of Dundee Photographic Society and whose enthusiasm never dimmed in the slightest as he approached his 80s. He was still trading in his Canon DSLR for the latest model as soon as it hit the market. The best cure I've found for RSI caused by using a mouse was changing to using a trackball. The problem with using a mouse is you're constantly gripping it to lift it and move it when you run out of mousemat. The gripping action is what strains the muscles in your hand. With a trackball there's no gripping or lifting required. Hey - you can't blame me! I think you've been Gassing longer than me Bruce to be honest, and you know what, there's nothing wrong with it. You made the right choice though - the Autocords are lovely little machines but feel very very lightweight against something even as 'amateur' as a Rolleiflex T.
I am lucky in that the focus on my Autocord is very smooth indeed, but the lens is scratched to bits and it has no leather on it -this being said, if you want a true vintage rendition then I can really recommend them, but it isn't a Rollei . . . £149 is a good price for one though. I think being satisfied in photography is difficult, there's always the what if thing, you know, what if I had that lens, I'd maybe make better pictures, or what if I had that camera system, then I wouldn't need to worry about anything again. At the end of the day though you can make a satisfying photograph with a simple box with a hole in it, so it must just come down to the fact that real, film-toting cameras are just such lovely things to own. Living antiques if you like, and using them, even briefly for a couple of rolls of film, is a really enjoyably experience. I know a chap who must have a couple of hundred cameras (f'rinstance, every Leica SLR!) but he doesn't really use them at all, sticking instead to the ease of digital. Now I feel that is GAS gone BAD. At least you use your cameras, so don't beat yourself up. Oh, and being pedantic, you are British . . it's ARSE. Y'hear me . . . ARSE!! I've never owned a Rolleiflex, but always wanted one. I've owned a number of 'Cords, though. I like my lovely little Minolta Autocord better than the Rolleicords. For that price, I would have bought it. Marty - not to be pedantic - over here in lovely cheap Britain, 2 boxes of MGRC 10x8 and a bottle of fixer . . . ! Or 30 rolls of TMX 400 . . .
For 149 you would not only get a nice camera, but a beautiful piece of industrial art. Just put it on a shelf rather than a dark closet. I had one Rollei but when I came across another one at a great price, I got (justified) it for that very reason (takes great pics too). I love looking at them and guests are fascinated. I'll be taking both on a two week trip coming up.